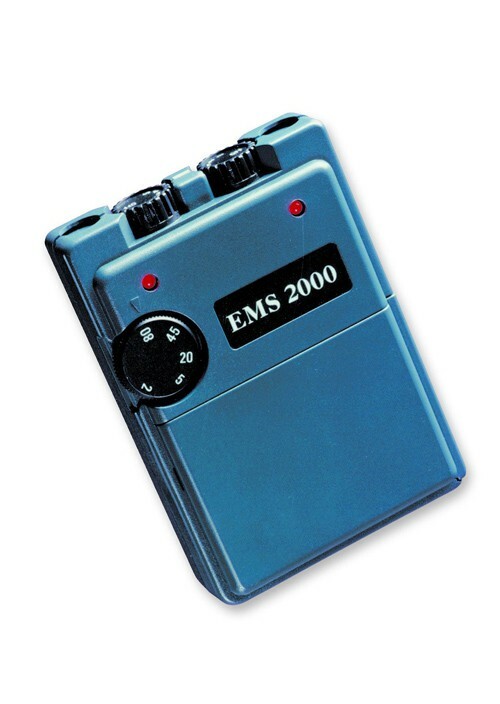 EMS 2000 is an EMS device with a dual-channel analog EMS device and three stimulation patterns: constant, reciprocating and cycled. This convenient, EMS device conveniently increases range of motion, reduces muscle atrophy, re-educates muscle, prevents venous thrombosis and improves blood circulation. Via electrical stimulation therapy, this BioMedical Life Systems machine has an adjustable pulse rate of 1 Hz-80 Hz and a pulse width that is fixed at 300 Us. This is the ideal EMS machine device for anybody seeking a non-invasive, effective way to combat nerve and muscle pain. 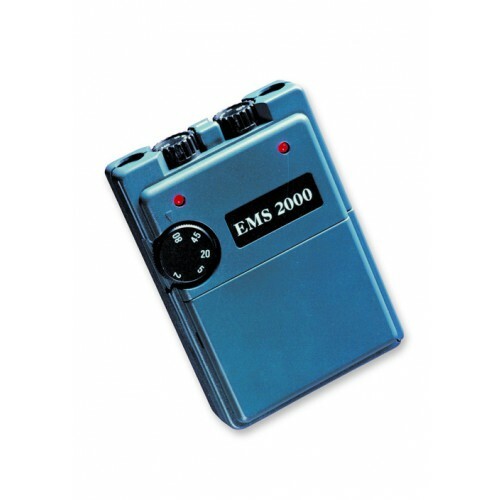 EMS 2000 includes a kit that is equipped with 4 electrodes, lead wires, battery, carrying case, instructions and a five year warranty in case of any emergencies or malfunctions with the machine. Designed in an easy-to-use, sleek black case, this electrical stimulation therapy device makes the perfect solution to any person seeking a personalized and non-intrusive way to combat muscle and nerve pain. You might also be interested in similar electrical stimulation therapy devices, such as an Interferential Unit. Dual-channel analog EMS device consists of three stimulation patterns: constant, reciprocating and cycled. Machine increases range of motion, reduces muscle atrophy, re-educates muscle, prevents venous thrombosis and improves blood circulation. Equipped with an adjustable pulse rate of 1 Hz - 80 Hz, and pulse width is fixed at 300 us. Kit includes 4 electrodes, lead wires, battery, carrying case, instruction and comes with a five-year warranty. Reciprocating simply means alternating pressure, according to the manufacturer. During operation the machine will alternate pressure where needed. I purchased this muscle stimulator after 2 months of PT with slow gain of quads, specifically, VMO strength. My PT set the unit for me and I use it 3 times a day! It is very helpful and doing what it is suppose to do. Only wish pads were more secure, so I could use machine while I exercise, especially walking. Bought it 5 years ago for some physic. Put it away in a drawer and forgot to take out the battery. Recently "found" it again and decided to use. Amazed that the battery had lasted (even unused) all this time and that the unit operated perfectly - as it did when it was new. Unlike many electronics these days this seems well built. Thanks. Handy little machine. Good strong contractions that relieve the muscle spasms. Delivery on time. The doctor gave me a prescription for this together with the number of your company. He told me to buy this and send you the prescription. But what I did was I faxed the prescription before I called. When I called the representative I spoke with naturally was clueless about the papers I faxed. But she was very patient, she asked around and checked the computers and after a short while she found my prescription, to my relief. I couldn't thank her enough for taking care of what I need to get this. need better instructions on how to use the ems and the use of the different settings.